Greetings friends and fellow crafters, LeeAnn here to host the blog. My project here today is a card that I made using paper and PowderPuff Chalk Inks from Quick Quotes and a stamp set from Joy Clair. I stamped the ship image with Mocha Mama and set aside to dry. I then went to work with the base panels. The main panel cut from Chiffon is 4.5 x 5.75. I then made a smaller layer of 4.25 x 5.5 from Adventure Awaits. A panel of white that had been run through an embossing folder and cut to 3.75 x 5 was attached next. Next, I cut Adventure Awaits again at 1 x 3.5 to make a smaller banner tail. I used a rope stitched oval die to cut the panel for the ship. 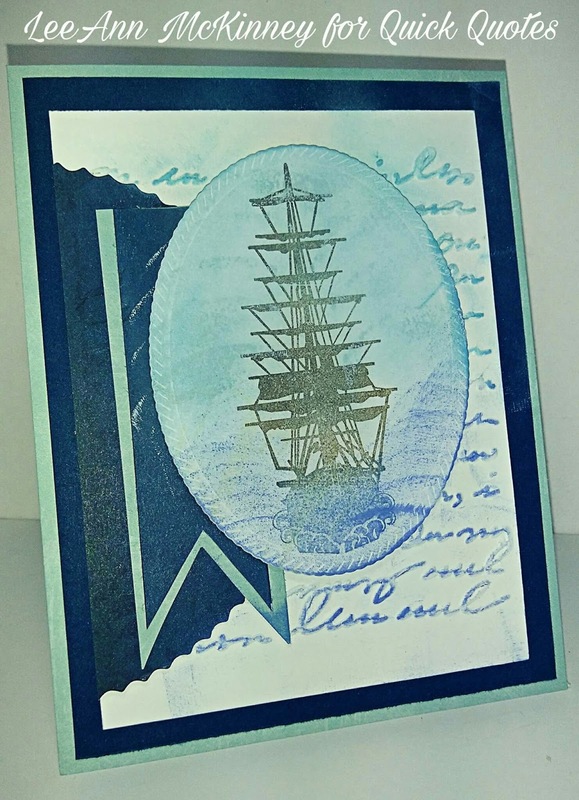 Once that the ship was dry, I used Royal Blue for the water and Sky Blue for the sky, both on the image panel and the embossed sheet underneath so that it all flows together. Thank you for checking out my project today. Please come back tomorrow to see what our next designer has for you.